Michel Brousseau was introduced to music very early in life. His passion and talent were quickly noticed and he started intensive piano studies at the age of nine. He rapidly developed a special interest in symphonic music and, at the age of fourteen, already knew that he would become a conductor. He studied conducting under maestro Raffi Armenian, completing his studies at the Montreal Conservatory of Music, where he was unanimously awarded the First Prize in piano. He also studied conducting with Otto Werner-Müller, Milen Nachev, Valery Vachev and Aldo Faldi, among others. In 2005, he was a finalist in the “Luigi Mancinelli” International Opera Conducting Competition in Italy. He has conducted in Italy, France, the Czech Republic, Romania, Bulgaria, Ukraine, the United States and Canada. 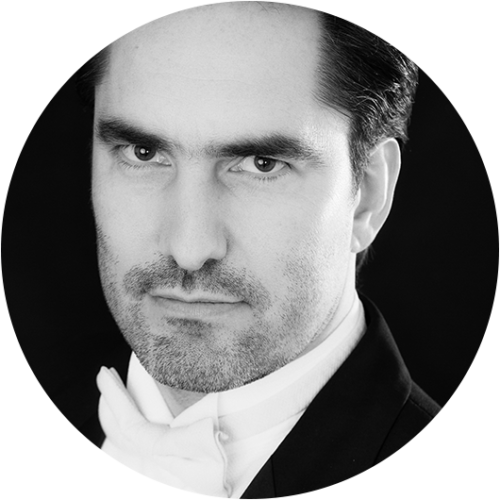 Michel Brousseau is the Musical Director for the Pellegrini Opera in Ottawa since September 2016. Amongst his latest accomplishments, Michel Brousseau was invited in Italy to act as one of the jury members of the oldest and most prestigious piano competition in Italy – Nuova Coppa Pianisti. Maestro Brousseau was invited to conduct six performances of the Pinocchio Opera at the very prestigious Teatro San Carlo di Napoli. The maestro conducted the closing concert of the fourth edition of the Festival Civitanova Classica with the Orchestra Filarmonica Marchigiana and Lorenzo Di Bella, pianist. At Christ & St. Stephen's Church in New York, NY. Maestro Brousseau directed the Altamura String Ensemble in Debut, a group of elite musicians who received the highest awards. Also in 2011, Michel Brousseau, four guest soloists, four choirs and a full orchestra were very successful at the National Arts Center in Ottawa, where they presented the Messa da Requiem by Giuseppe Verdi. In September 2010, Michel Brousseau took his seat at the piano and participated in the charity concert organized jointly by the Conference of Non-Governmental Organizations (NGO) and the Nightingale Initiative for Global Health (NIGH) at the Lincoln Center in New York, NY. To support the global campaign to support maternal and child health. Following the success of international tours and invitations to perform abroad, Michel Brousseau created the International Choir for the sole purpose of performing abroad. In June 2010, Michel Brousseau and the International Choir were invited to present the Solemn Mass of Saint Remi by Théodore Dubois at Carnegie Hall in New York, with the New England Symphonic Ensemble. This event marked the first presentation of this work on a stage in the United States. In recent years, Michel Brousseau’s passion for opera has reached new heights and he devotes the greater part of his career to this repertoire. He directed more than a dozen operas in several opera houses around the world – Madama Butterfly (Puccini), La Bohème (Puccini), Suor Angelica (Puccini), La Traviata (Verdi), Cavalleria Rusticana (Mascagni) , I Pagliacci (Leoncavallo) and Carmen (Bizet), among others. In August of the same year, Michel Brousseau and his choirs toured Sicily (Italy); They gave a series of concerts in the provinces of Catania and Ragusa where they participated in the “14th Premio Ragusani nel Mondo” of the city of Ragusa. During his stay, Michel Brousseau was invited to conduct the Belgrade Philharmonic Orchestra in Ravello, Modena and Bassano del Grappa, with the help of the famous violinist Uto Ughi. Michel Brousseau discovered several works still unknown to the public. Seduced by this music of an unquestionable artistic level, Michel Brousseau’s mission is to rediscover to the public the music left by this composer. A disc of the most beautiful Italian and Slavic Airs for soprano and orchestra, under the direction of Michel Brousseau, will be on the market soon.